Hey there! Welcome to my 1st post of 2016! This year is gonna be a great creative year for me-I can just feel it! I'm really trying to branch out and get to the next level in paper crafting. I'm learning more about blogging so watch for more links and "stuff" on my blog as I go along! :) Also part of my growth as a papercrafter this year is participating in card/paper crafting challenges. I've started doing that on Split Coast Stampers. If you aren't familiar with them you should definitely check them out. They have challenges every day of the week. Today I'd like to share the cards I've made for challenges this week. This is the first challenge I did. The directions called for creating an image with something other than a stamp. I used my hand! I inked up my hand with an ink pad and pressed it on whisper white paper to make a very cool background. I used soft suede, crumb cake and chocolate chip inks. 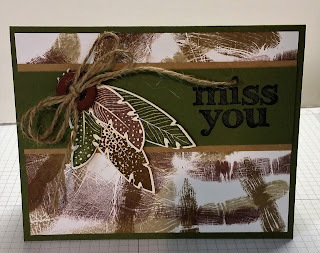 I absolutely love the Four Feathers stamp set and framelits and used those here in Mossy Meadow, soft suede and chocolate chip. I adhered my handprint matte onto a mossy meadow card base. I used kraft and mossy meadow for the accent pieces. The "miss you" stamp was a $1 at a local AC Moore and I used a 50% coupon! Love those finds! Found a button in a my stash that matched and some jute twine and voila! Challenge completed! I'm very happy with how this card came out! These next 2 cards were done for the same challenge where you had to use a certain layout. This layout called for the stripes on the left side, the 2 circles and an accent off the smaller lower circle. I did the Happy Birthday one 1st and had so much fun decided to do another one! For the Happy Birthday one I used Club Scrap's Stamping Star 1 as my focal piece. It was perfect since it's a circle already! I just love this stamp and that you can cut the rings off to make the image any size you want. I cut off the outer most ring to make it the right size for my card. I used Basic Black for the card base, Whisper White for the stripe and added "All is Calm" washi tape in Lost Lagoon to make the other stripe. I stamped the star in black Versamark onto Lost Lagoon cardstock. I used a metal embellishment I found at a Real Deals dollar store for the smaller circle accent! 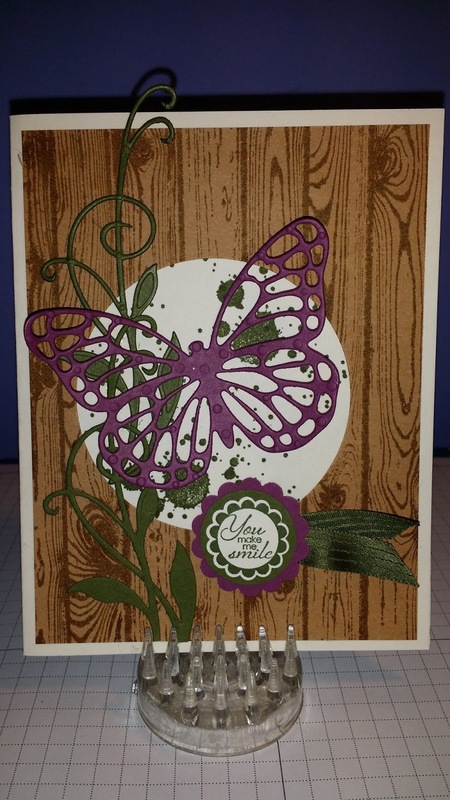 For the 2nd card I used Very Vanilla for the card base and stamped the background stamp "Hardwood" onto kraft paper with Soft Suede ink. 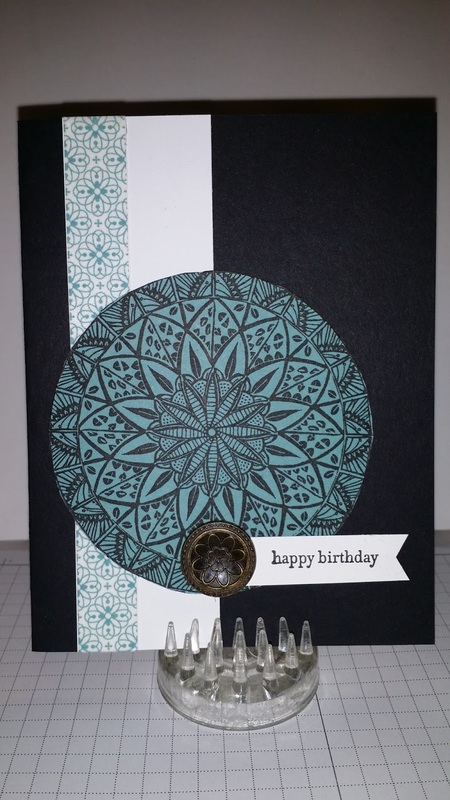 I cut a circle out of the matte with a basic circle die cut and stamped behind the cut out with "Gorgeous Grunge" in Mossy Meadow. I got the butterfly framelits for Christmas and have cut a whole flock of them! Love them! Cut this one from Rich Razzleberry cardstock. 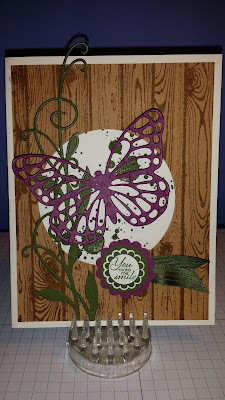 I cut 2 flourishes from Mossy Meadow and overlapped them a bit to fit the full height of the card. The sentiment is from "A Round Array." I used a bit of Mossy Meadow ribbon and done! 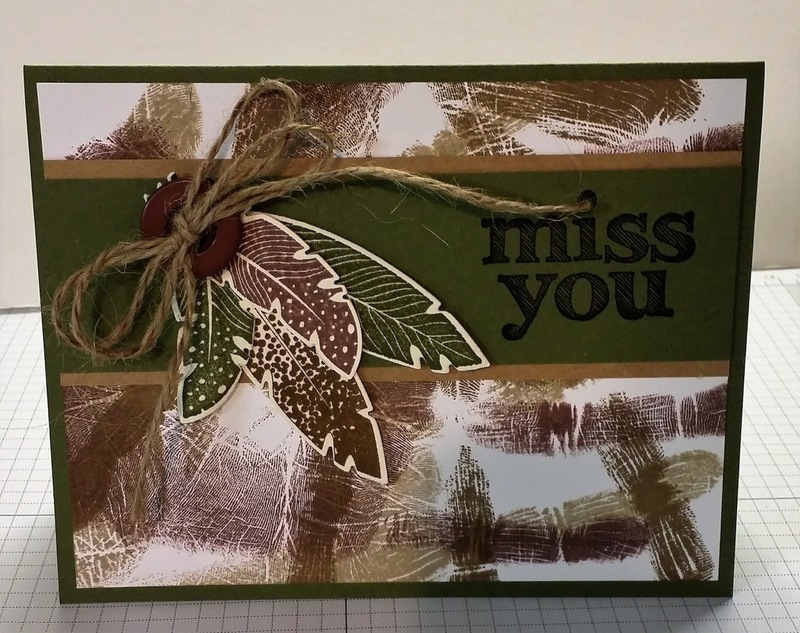 I uploaded my cards onto splitcoaststampers.com and couldn't believe the response I got. Everyone was so friendly and complimentary and welcoming! Such a great site! I will definitely do more challenges. You can upload cards and projects to your gallery on the site just to share also. Check out my gallery here.